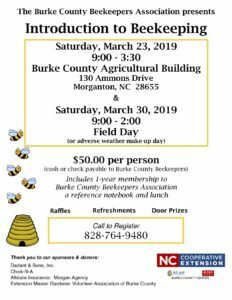 The Burke County Beekeeper’s Association is presenting its annual Introduction to Beekeeping on Saturday, March 23, and Saturday, March 30, 2019. This 2-day school will consist of classroom work on the first Saturday and practical, hands-on activities the next Saturday. All of the basics will be covered by area beekeepers and resources for beekeeping supplies will be available. Lunch will be provided both days as well as a manual for first-time beekeepers along with many other materials. The cost of the school is $50 and pre-registration is required. Contact the N.C. Cooperative Extension, Burke County Center at 828-764-9480 for more information.